Today is the Seventh Day and Second Shift of SSC CHSL 2018 Exam. This exam is scheduled to take place from 04th to 26th March 2018 and is being conducted in 03 Shifts (10 AM to 11 AM, 1.30 to 2.30 PM & 4.30 to 5.30 PM) each day. 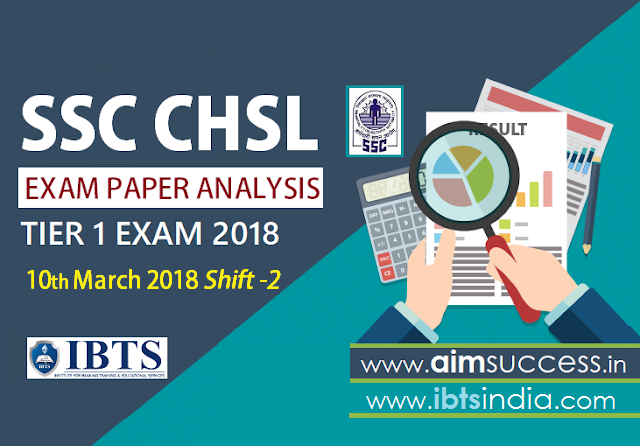 As the SSC CHSL Exam for 02nd Shift is over now, have a look at the SSC CHSL Tier-I Exam nalysis 10th March 2018: Shift - 2 and Know about the Good Attempts and Section-wise & Overall Difficulty Level of the exam to stratagize your exam preparation for coming SSC CHSL Exam. In SSC CHSL Tier-1 Exam 2018, English language section was easy-Moderate, this time there were no RC(Reading Comprehension) instead there were 01 Cloze Test with 05 questions based on it and questions from it were of easy-moderate level.